GALENA PARK: left to right: Raul Mejia the President of the Parks and Recreation Board & the Galena Park Baseball Little League, Ernesto Paredes the Parks and Recreation Director for the City of Galena Park, Maria D. Rodriguez Parks and Recreation Board member, Jerome Mauvigney, Houston Refinery Site Manager, Eric Broussard Parks and Recreation Commissioner for the City of Galena Park, Denise Jennings, Houston Refinery Facilities Services Leader, and John Finck, Houston Refinery Development Leader. 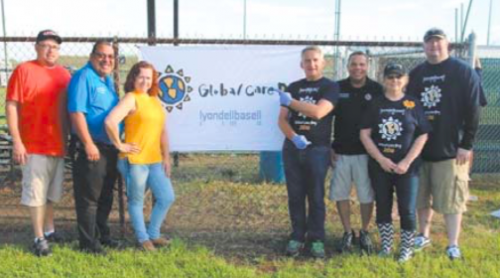 The 17th annual LyondellBasell Global Care Day is a worldwide community service initiative involving thousands of volunteers where the company has operations. Workers from 69 sites in 23 countries are participating.